Saffron is the world's most expensive and rarest spice. Taken from the dried stigmas of the purple saffron crocus, it takes anywhere from 70,000 to 200,000 flowers to make one pound of saffron. The flowers are individually hand-picked, in the autumn, when fully open. Fortunately, only small pinch of Saffron needs to be added to a dish to lend it color and aroma. 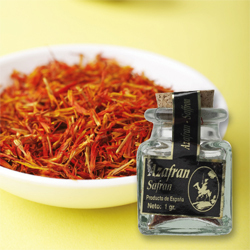 A regular grade saffron that you?ll want to use for saffron rice and dishes with complex flavors such as paella. Lovely yellow color and strong flavor and aroma. Priced lower than ever before! Note: One gram of saffron is a pile about the size of a quarter. Since 1/8 tsp will flavor 4 servings of rice, a 1 gram box will last about as long as a standard spice jar of other spices.